Margie (Homepage) wrote: That's a mold-beraekr. Great thinking! Kevin from OrganicPIX.com (Homepage) wrote: Stunning blues - love the gradient light - plus, you can really feel the weight of the snow on the trees. jbm (Homepage) wrote: Wonderful ! I'm fan ! pippone (Homepage) wrote: like sugar. pure winterscape, perfect picture. Gromitch (Homepage) wrote: Great! I really like this kind of your photos! Erikou (Homepage) wrote: C'est MAGNIFIQUE, j'adore !! !, trés belle gestion de la lumière ! Andy (Homepage) wrote: Wow amazing photo. Love the sense of cold in this photo. Arjan - PlasticDaisy (Homepage) wrote: Stunning image! Well done! So much detail and the light is wonderfully captured! gavin hart (Homepage) wrote: The trees seem to resemble people trudging up the mountainside and stooped over with the weight of snow. Nicely composed. I like the burst of sun behind the branches. Marie (Homepage) wrote: magnifique ! Tom (Homepage) wrote: Lovely sharp image. The tree looks like a monster climbing up the mountain. philipp (Homepage) wrote: very beautiful, the snow and the trees look great. beanow (Homepage) wrote: Very nice! Dancing pines...:) Stunning lght. Andrew (Homepage) wrote: So crisp and clear I can smell the fresh air and feel the nip of the cold on my face. Perfect position angle. Awesomely beautiful! LightningPaul (Homepage) wrote: Very beautiful! I love the sun and very blue sky. The trees are well lit. Fantastic composition. birgit (Homepage) wrote: totaly great! love this dynamic view of winter! Sabine (Homepage) wrote: I love snow photos and yours are great. This one is no exception. You have just the right exposure. Well done. martie (Homepage) wrote: This is an absolutely stunning winter scene. Just excellent. Belongs on a wall for everyone to enjoy! oldshutterhand (Homepage) wrote: A short break from theyr frosty stress. Terry H. (Homepage) wrote: Love the bright sunshine along with the snow. Its beautiful! Laurie (Homepage) wrote: I love the sun flare. Beautiful winter landscape. John Maslowski (Homepage) wrote: Truly a winter wonderland image. 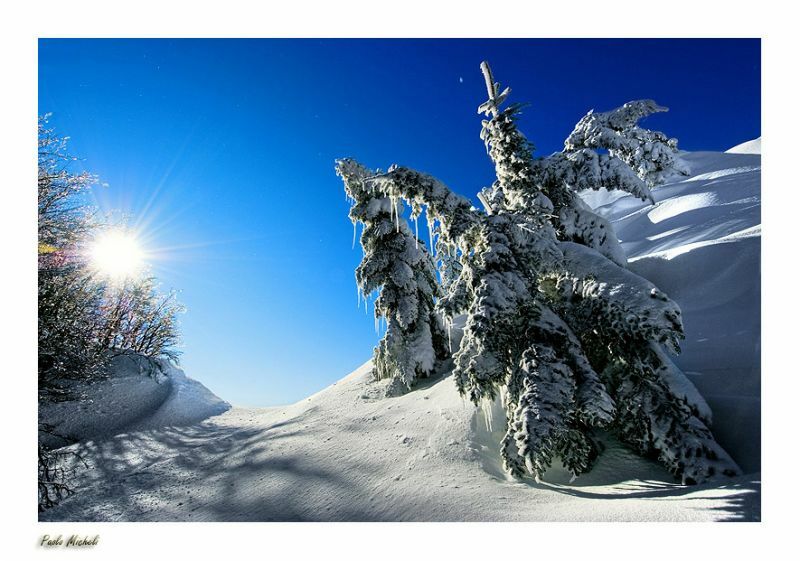 Beautiful sun rays and snow covered tree. Love the angle of this shot, excellent work! Cristian (Homepage) wrote: What a nice place to be. Good capture! Calusarus (Homepage) wrote: Almost a postcard, with this PoV, and this light ! Elaine- (Homepage) wrote: absolutely stunning! what clarity, what colors! TP@Photoskiasi.com (Homepage) wrote: Looks like we was all shooting snowy landscapes during holidays Paolo. :) I saw a lot of photos of snowy landscapes these days and this is one of the few i saw where the snow is not "grey". If you know what i mean... All the best for the new year and congrats for the 2008 Coolphotoblogs Awards ranking. pedro alexandre (Homepage) wrote: beautifull, i like the flare. Liang (Homepage) wrote: lovely sun exposure shown in this shot. I also like the bended trees =D Hope the new year has started well for you. Michael Skorulski (Homepage) wrote: A classically beautiful image, Paulo. Lunamania (Homepage) wrote: I love the rays coming from the sun and hot the trees look like they are bowing to it. The blues are rich and soaring too. Great shot. Siam (Homepage) wrote: Photograph in this light of a blue sky, my wishes for 2009.
grant (Homepage) wrote: this has such a dramatic feel - like a place where one would plant a flag after arriving! Frida (Homepage) wrote: Beautiful scenery! With great light and colors. Albert (Homepage) wrote: Great capture, Paolo. Olivier Jules (Homepage) wrote: wonderful capture! Ilan (Homepage) wrote: Ahh.... This is beautiful. Amazing scenery, and so much colors and what seems to be a "colorless" frame :) Just print it large, and hang on the wall. Krims@nline.be (Homepage) wrote: Woooow, what a nice blue sky. Love the shadow in the white snow. A great picture, with an even greater composition! Congartulations.